CloudFlare® – must have performance & security solution for you Magento store. 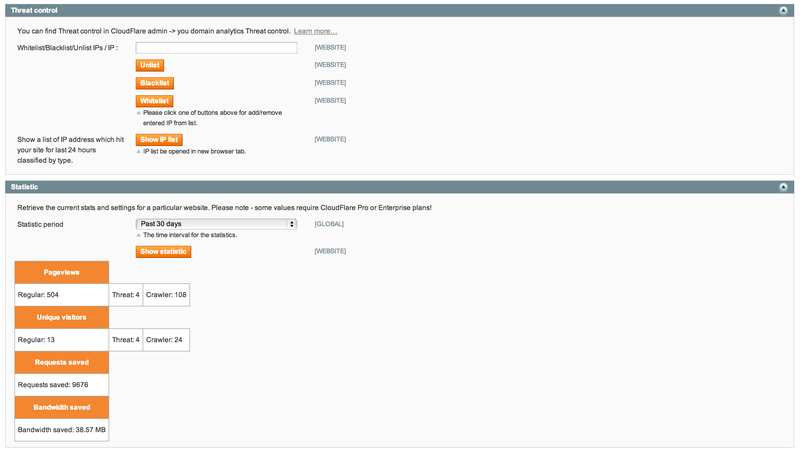 Control for CloudFlare® Magento extension. CloudFare is the world best CDN, DNS service made for huge performance improvement and security of your Magento store! If your store is a part of the CloudFlare® network, your domain web traffic is routed through CloudFlare® smart worldwide network. CloudFlare® makes auto optimization of web pages delivery, so your visitors get faster page load and amazing performance. Such changes affects customers loyalty – being more satisfied with your E-Commerce store performance, they will be more loyal to your business. CloudFlare® also takes care about advanced security and DDoS protection of your Magento store – it blocks threats and limits abusive bots and crawlers from spent website bandwidth and server resources. To summarize the significance of CloudFlare® we should say, that it takes care about two most important things from any Magento store – performance & security! With CloudFlare® control Magento extension you can control main features of CloudFlare® directly from your Magento admin page. Control for CloudFlare® extension supports all the main methods of CloudFlare® API. You can save a lot of time working with CloudFlare® settings directly from Magento backend, so this is a must have extension for any Magento store what use CloudFlare. Upgrade to recent CloudFlare API v4 (https://www.cloudflare.com/docs/next/) now in progress – show IP list and update snapshot features not works temporary. We offer free upgrade for all customers – you can purchase now and use all main features already! CloudFare® is the world best CDN, DNS service made for huge performance improvement and security of your Magento store! Launched back in 2009 CloudFlare has gained its userbase to 1.5 million users. Now it has 5 percent of all web requests, it means that every 20th site is on CloudFlare. Such popularity turned CloudFlare into the target for one of the biggest DDoS attacks in the history of the internet. CloudFlare CDN – Make your content closer to the visitors, speeding up your site. CloudFlare optimizer – Make both mobile and computers equal: web pages with ad servers and third party widgets load as fast as possible . CloudFlare security – You have a protection against spammers, SQL injection, DDOS and other threats. CloudFlare analytics – Get all information about your website’s traffic – Know about threats and crawlers. 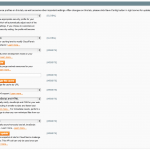 CloudFlare apps – one-click simplicity, speed and safety for CloudFlare apps installment. If your store is a part of the CloudFlare network, your domain web traffic is routed through CloudFlare smart worldwide network. CloudFlare makes auto optimization of web pages delivery, so your visitors get faster page load and amazing performance. Such changes affects customers loyalty – being more satisfied with your E-Commerce store performance, they will be more loyal to your business. CloudFlare also takes care about advanced security and DDoS protection of your Magento store – it blocks threats and limits abusive bots and crawlers from spent website bandwidth and server resources. To summarize the significance of CloudFlare we should say, that it takes care about two most important things from any Magento store – performance & security! To add your online store to CloudFlare network you have to perform few simple changes to your domain’s DNS settings. The whole process takes less than 5 minutes. You don’t need any extra hardware or software, and any changes to existing code are also unnecessary. The service is absolutely free, but you have to pay for some extra features: SSl, time reporting, etc. CDN is a large distributed system of servers which consists of multiple data centers across the whole network. Content delivery network of CloudFlare is slightly different from classic one. It is constructed considering recent changes to web server technology, hardware and network routing. That’s why CloudFlare’s network is the next-gen CDN: it is faster, more affordable and has better performance. CloudFlare’s CDN reduces latency and hops. With 24 data centers around the world its CDN automatically caches static files at edge nodes so all the necessary files are stored closer to the visitors. And the dynamic content is delivered directly from the web server. Thanks to Anycast technology all the visitors are routed to the nearest data center. This leads to noticeable increase in performance – the website loads twice as fast regardless of their location. Such approach can save up to 60% of bandwidth. And the last but not the least: there are no any bills for bandwidth usage! it provides support for IPv6 networks and works with other CDNs. Security options of CloudFlare are also strong. SQL injection, DOS attacks, cross site scripting, comment spam, email harvesters or excessive bot crawling can be blocked by security system. CloudFlare’s technology automatically learns new attack and blocks them throughout the entire community. There are only 5 security options so it is extremely easy to work with CloudFlare protection. You just have to choose the necessary option among “I’m under attack!”, “High”, “Medium”, “Low” and “Essentially off”. Threat reports and details are also available for viewing. Browser integrity, Visitor reputation, Block and trust lists, Saved bandwidth and server resources, Additional protection of SSH, FTP and Telnet ports, Infected users notification are main CloudFlare security features. With CloudFlare you can monitor and control threats, examine traffic (the data can be sorted by time, visitor type or traffic types) and track search engine crawlers. All the information is updated in real time, can be augment with third party analytics and viewed geographically. With CloudFlare it is also possible to learn about where visitors are leaving the website. Railgun is very useful thing. It ensures that the connection between origin server and the CloudFlare network is as fast as possible. As a result you get up to 140% additional performance increase. Accelerated connection between CloudFlare data centers and origin servers gives significant speed increase even when the request cannot be served from CloudFlare cache. Approximately 2/3 of requests to CloudFlare sites are served from the nearest data centers. These are cacheable requests. But there are such things as home pages of news websites and other pages with frequent personalisation, so 1/3 of all requests are sent to the original servers. And it is almost impossible to cache them, but with the Railgun you get a collection of features and techniques designed to cache and accelerate these previously uncacheable web pages. A request made to a CloudFlare server is turned into HTTP connection to the origin server and this is the time for Railgun to act. The Railgun consists of two parts – the Listener and the Sender. The first one is installed on an origin server (64-bit Linux and BSD systems), the second one – onCloudFlare data center. CloudFlare is very useful for E-commerce stores. Besides better performance it is possible to create whitelists of CloudFlare’s IP addresses, restore original visitors IPs and get better SSL within few steps if your site is a part of the network. Higher speed better security and plethora of additional useful features make CloudFlare one of the best additions to your e-commerce website. It is extremely easy to install, configure and manage CloudFlare and it has reliable support system, so you will get only timely responses if necessary. 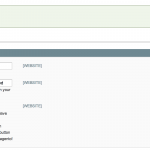 Purge cache – clean CloudFlare® cache directly from your Magento admin just with one click! 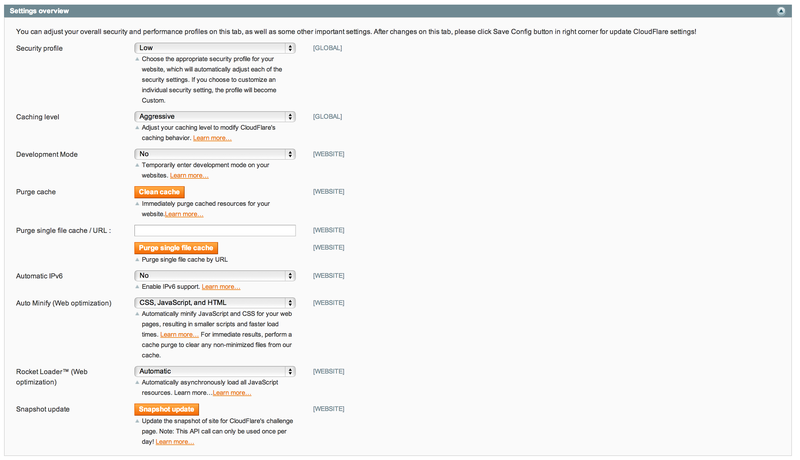 Snapshot update – create snapshot of your site, what will be used by CloudFlare® for challeng pages. Statistics – see CloudFlare® statistic for you store (Pageviews, Unique visitors, Reuqests & Bandwidth saved by CloudFlare®). Real visitor IP – if you use CloudFlare® with Magento store, you can’t get more real IP addresses of you customers anywhere in Magento admin and core because all requests are handled by CloudFlare®, so you get only different CloudFlare® IP’s. With this build-in Control for CloudFlare® extension you can get real visitors IPs. “Control for CloudFlare” was not made by CloudFlare, Inc.
Homepage » Our extensions » CloudFlare® – must have performance & security solution for you Magento store. 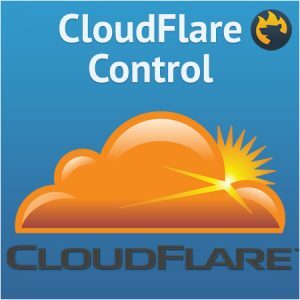 Control for CloudFlare® Magento extension.